We have a winner for our first Fairy Tale Fandom poll. And it is (drum roll please) . . . Puss in Boots! 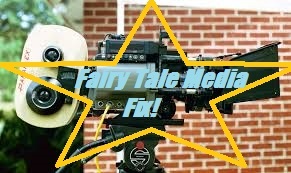 You know, the reason I wanted to review the various Cannon Movie Tales is because of the strange way we approach fairy tale productions. For those who don’t know, Cannon Films was one of the most infamous low budget movie studios of the ‘80s. They’re the studio that created such famously cheap, flawed pieces of work as Breakin’ 2: Electric Boogaloo, the straight-to-video Captain America movie and the Masters of the Universe movie. They excelled at creating cheap action movies. Heck, they’re pretty much the reason Jean Claude Van Damme became a star. When you see the logo “Cannon Films” or the credit “A Golan-Globus Production”, you should know exactly what you’re getting. Yet, the funny thing about fairy tales is that they’re the one kind of fantasy story we should expect to get adapted on the cheap. Maybe it’s their ubiquity. Maybe it’s the fact that they’re often aimed at children. But how many low-rent animated adaptations have there been? How many Christmas pantomimes? How many school plays or puppet shows? Sometimes I think Disney only became as famous at adapting fairy tales as they are because they throw a whole lot of money into their productions. Anyway, let us go on to our main subject here. Puss in Boots was a live action family musical starring Christopher Walken and Jason Connery (son of actor Sean Connery and star of the show Robin of Sherwood). Trailer video? Sure, have a trailer video! The story basically follows the story as it was written down by Charles Perrault. The one major difference is that instead of a cat walking around in a pair of boots, when the cat puts on the boots he becomes Christopher Walken. Though the trailer suggests that this is a magic power embodied by the boots themselves, it seems to actually be a power that Puss possesses. He appears for brief moments toward the beginning of the film to tell Coran the miller’s son (Connery) to get him some boots but appears to be unable to keep that form. It’s like he can’t do this specific trick for long unless he has a nice pair of footwear. They make pretty good use of this "trick", though. Beyond that, it’s a fairly faithful adaptation. Basically, it’s the story of a cat who undertakes a complex confidence scheme in order to get his poor master, a miller’s son, married into royalty. There’s some gift giving, some lying and a little ogre slaying. Some parts of the story are tweaked. Other parts expanded upon. One thing they expand on is the part of the ogre. In Perrault’s tale, the ogre just kind of appears at the end. In this film, he’s introduced early and Puss and Coran have a run-in with him early on. However, the ogre isn’t really given more character development as much as just more screen time. Another aspect that expands the tale is the role of the princess. The princess in Perrault’s tale didn’t have much going on besides being conned into marriage below her station. In this film, we’re presented with a princess who is clever and a bit feisty (remember, this is the late ‘80s. Princess Leia had already debuted in Star Wars. Feisty princesses were starting to be in). She’s clearly fed up with all the “genteel” ways she has to act and tired of the governess who is making her learn them for the purpose of betrothal. It’s to the point where she’s absolutely thrilled with the idea of marrying a miller’s son when Coran confesses who he really is (you know, if this movie were made today, I bet the princess would have sleuthed it out herself to show how clever she is. But I give the film points for making Coran an honest fellow). The other way the movie expanded things out is with musical numbers. Now, I’m not an expert on music by any means. I’ll try my best, though. The songs in this movie are fun in the moment you’re listening to them, but I don’t think there are any great examples of songwriting here. The performances are pretty good, but then there’s Walken. Christopher Walken is not a terrific singer (as we may all remember from that Peter Pan Live thing). So, despite having a fair chunk of the songs, he does verge a bit on talk-singing a lot of them. He conveys the message of the song and the place it has in the story, but it’s not great. However, he’s a surprisingly good dancer (as you may remember from the music video for Fatboy Slim’s song “Weapon of Choice”). When given the chance to cut loose dancing, like in the “country dance” sequence of this film, he’s actually pretty good. The place where the low budget really becomes obvious is in sets, costumes and special effects. For special effects, this movie has a tendency to overlay stock footage onto background from scenes from the movie. When the ogre transforms into a tiger, bear or elephant, you can tell that the tiger, bear or elephant was not actually in the scene. They do a similar thing with Puss in an earlier scene. In terms of costumes and sets, a lot of them have this vibe of being something made for a theme park or particularly high-end renaissance faire. I think it’s probably most evident with the king’s carriage. Also, the ogre is clearly just a large man wearing padded clothes to make him look even larger and a face painted green. And yet, despite the flaws, I can’t say that this film is a bad watch. Why? Because it plays to the strengths it does have. Walken himself is an entertaining, charismatic presence. The movie also likes to play around with the social situations in the plot. It’s clear from the beginning that Coran, while being a bit of a wet blanket, is not really any worse or more unfit than the king or any of the nobility. In fact, the first time we see the king, he’s playing with toy soldiers. Meanwhile, Coran is unfailingly practical. After Puss tells Coran that the king wants to meet him, he muses on what kind of work the king is going to give him, fully expecting to end up as a stable hand or a scullion only for puss to let him know later that the king thinks he’s a marquis. There’s a whole song about how acting “genteel” is essentially acting like a hypocrite. And in another scene, Puss manages to convince the band at a ball to play a country dance to cover up Coran’s lack of skill at courtly dancing by telling them that the Marquis had just been travelling and that country dancing is “all the rage abroad”. There are a few other scenes like that, but I don’t want to give them all away. But it’s really watching Walken’s Puss play the role of social engineer that makes the movie fun. It’s certainly entertaining for what it is. When watching it though, you just have to expect it to fall in a strange budgetary middle ground between Shelley Duvall’s Faerie Tale Theatre and a Walt Disney production. So, that’s it for our first Cannon Movie Tale. There’ll be a new poll going up soon, but I won’t get to the review for a little while after that. You see, February is Black History Month here in the United States and I thought I’d spend the rest of the month spotlighting some tales from Black communities in the U.S., Africa and the Caribbean. So, stay tuned. Oh, yes, I remember this one. It’s part of a series that has some impressive names among the cast members. I think it was the one that had a version of Aladdin with Leonard Nimoy as the evil Wazir...Long time since I saw it. But it’s fun checking out who plays what in each fairytale. Two different series. The Cannon Movie Tales like this one are a series of full length movies. The one that had Aladdin with Leonard Nimoy was an episode of the show Shelley Duvall's Faerie Tale Theatre. Both have celebrities in them, though. 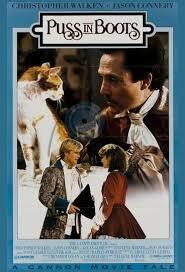 What does it say about me & my love for Puss in Boots that after watching that trailer, I still want to see this movie? Hmm - where can you get this movie? Is it on YouTube? It's probably on YouTube. I got it on a DVD set with, like, eleven other movies. It's not an unwatchable film. It's entertaining to say the least. Do you have plans to do Revolting Rhymes in future reviews?